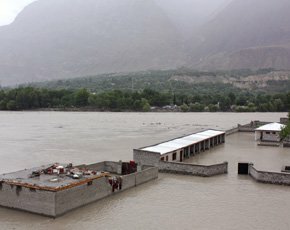 During the current plenary session held in Strasbourg on 7 September 2010, the European Parliament has found the time to discuss the humanitarian situation after the floods in Pakistan and assess the European response to the disaster. Kristalina Georgieva, European Commissioner for International Cooperation, Humanitarian Aid and Crisis Response (ECHO), opened the debate with a statement on behalf of the commission and her impressions after a recent visit to the country. She praised the quick response from the Commission, Parliament and member states in sending aid and triggering the appropriate response mechanisms. As she explained the two main disaster areas, the plight of the internally displaced people who have had to leave provisional camps and the destruction of agricultural land and sources of income for people downstream, still pose a great challenge for immediate relief and long-term recovery efforts. Members of the European Parliament were happy to learn about the Commission’s response and applauded the efforts by Commissioner Georgieva. Many pointed out the need for a long-term engagement with Pakistan to help recovery through trade links and investment. Several MEPs also urged the Commission to ensure that aid will be delivered to groups in society who are likely to be left behind when they need help the most. Véronique de Keyser (S&D) asked that special attention be given to the situation of women while Corina Cretų (S&D) and Sajjad Karim (ECR) advocated for better oversight on how assistance is used in order to win the support of the Pakistani population. Elija-Riitta Korhola (EPP) and Jürgen Creutzmann (ALDE) mentioned in particular the needs of ethnic minorities and the difficulties in administering aid in regions where corruption is common. Similar points have already been raised in a joint statement by UNPO members Balochistan, Sindh and Gilgit-Baltistan. Members of the Development Committee will continue to focus on the situation in Pakistan during their next meeting in Brussels on 4-5 October 2010 and the discussion will hopefully respond to the points raised my MEP during yesterday’s debate.